While ‘Never judge a book by it’s cover’ is a slogan that was hammered into my brain over and over, with a good reason, ever since I was in kindergarten, every once in a while there’s something that is openly defying this statement, tempting me to do the unspeakable and begin taking my impression from the cover. 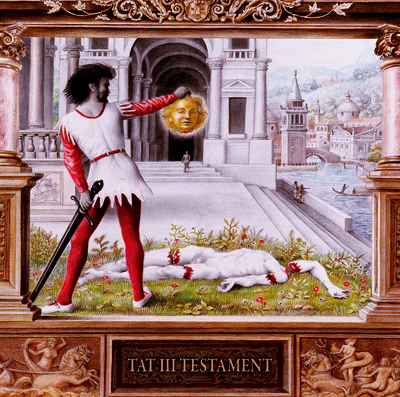 In this particular case, the wonderful art by Laurie Lipton (www.laurielipton.com) is really hard to ignore, introducing this album with a renaissance-esque painting which shows two really eerie sceneries, and suggesting something big is waiting inside this album. Fortunately, ‘Testament’ by TAT does not fail the high expectations that were built around the art section. These eight tracks build a rich story with an interesting mixture of genres and musical approaches which more than deserve the introduction they have on the cover. After a short, ominous sounding exposition in French, the first track kicks in with powerful old school EBM beats and an aggressive mood. This energetic opening should not suggest anything about the rest of the album, as the second track proves by sounding like a bombastic love song. The singing, no matter what style it is in any specific song, is dominant and well performed. On the fourth track we encounter a more traditional guitar playing, and the electronic beats that we found on the beginning of the album seem like a distant memory. We will later encounter militant drums as TAT explores different genres, ‘experimenting’ in more popular and catchy songs as well. One of the highlights of this album is the song ‘Astrophobos’. This slow, dark song is being immersed by TAT inside voice samples whith sound army related (or, as the track title might suggest, space exploration-related?). “Testament” is a well thought of album with many other great moments and an overall impressive execution.